The musical theme is one that runs deep in the novel- music is the language by which the characters communicate, issue directions, create maps, send messages and recognise each other. Characters do not run quickly but presto, silence becomes tacet and softness piano. I must admit to utter tonedeafness, so I did have to look most of these up. Being adverbs, it's not always clear from the context what a term means...but I am partial to an invented language, and I think it does an excellent job of illuminating the 'other-ness' of the World, and emphasizing the essential nature of music. The story follows Simon, a farm-child from Essex who travels to London following the death of his parents from chime sickness. Armed only with his bag of objectmemories and a snippet of song to lead him to a woman called Nettie, he begins his journey. Arriving in a strangely out-of-time London he joins a Pact, a group of other teen outlaws that forage in London's underground tunnels for Pale, a silence-producing substance desired by the Citadel for the maintenance of The Lady. I think. It's here he meets Lucien, an almost blind musical protégé that sees in Simon a rare gift for memory that could be the key to bringing down the Citadel, destroying the Carillion (the instrument of the Chimes) and releasing the truth, the memory and the stories that it steals from the people. 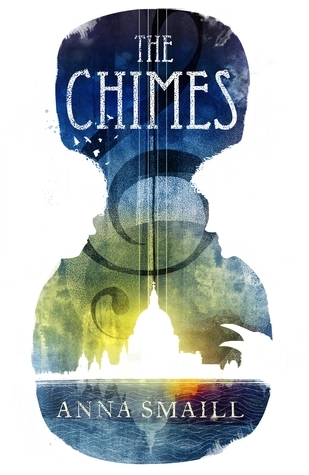 The Chimes took me 2 weeks to read, and I never felt like I was fully submerged in the story; it didn't cast any kind of spell on me and I found it quite easy to put down or become distracted from. However, when I had finished this book, I was ultimately very impressed with it, which I realise sounds contradictory. I was pleased I'd made it to the end, and for once, was thankful for my stubborn reluctance to give up on a book. I really admire the world of The Chimes, a place that is so wonderfully sensory and so full of beauty but rotten with corruption, lies and tyranny at the same time. I find the concept so utterly unique and so unusual that it's worth reading for the set up alone. I loved the relationship between Simon and Lucien- forging relationships in the World of Chimes seems difficult, and I loved seeing the two of them grow together and their relationship become more than just a quest pairing. The tenderness is palpable, and each of them is in awe of the other; Simon is stuck genuinely speechless by Lucien's musical gift, and Lucien is awestruck by Simon's ability to hold and examine memories in his mind and piece them together in a line- something incredibly rare in the World of Chimes. Though I struggled with this novel, it is undeniably a literary triumph. The prose is beautiful- full of a strange synaesthesia; light and sound and emotions all mixed together but understood as one. I can only imagine how rewarding an experience it must be for musical readers (which I most certainly am not). The characters are mysterious and compelling, and at its heart its a story of love and goodness and truth overcoming tyranny, however comforting and beautiful the sound of that tyranny. The novel is an odd combination of Christopher Nolan's Memento, Philip Pullman's Northern Lights (in the sense that this world is but a few shades different to ours, but these shades of difference make it seem like another planet, and the altered language) and a sort of Musical Theatre vibe, where singing or composing is a perfectly normal the expected method of expression. Remarkable, but requiring concentration and commitment.